Construction of the Yellowtail Dam was completed by by the Bureau of Reclamation. This dam, named after the famous Crow chairman Robert Yellowtail, harnesses the waters of the Bighorn River and turns this variable stream into a magnificent lake. Exhibits in the visitor center include construction and workings of the Yellowtail Dam, the unique geology of the area, details of the life of Robert Yellowtail, the Crow tribal leader when the dam was built and for whom the dam was named, the Crow Indians and the famed leader Chief Plenty Coups, and the history of Bighorn River and Bighorn Lake. On display are fish that one may expect to catch at Bighorn Canyon NRA. The visitor center is wheelchair accessible. Restroom facilities are available. 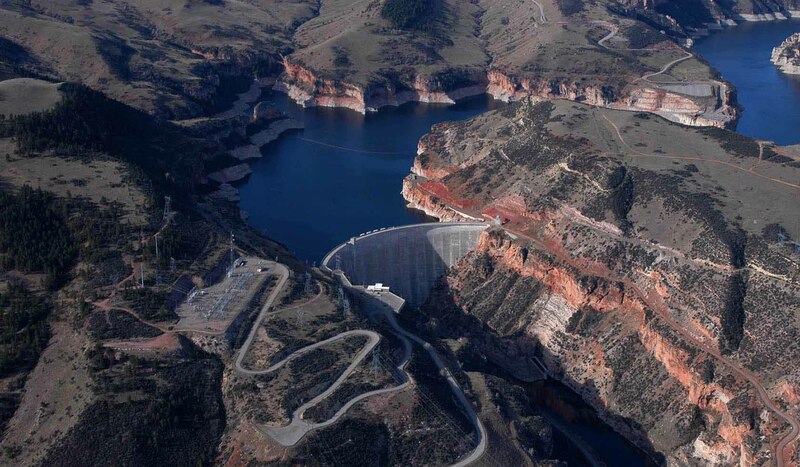 To reach the Yellowtail Dam Visitor Center, take Montana Highway 313 southeast from Hardin to Fort Smith. Continue straight through Fort Smith, and continue on the road (stay left at the fork after Ft. Smith) until you see the visitor center located near the top of the dam.To reach the Yellowtail Dam Visitor Center, take Montana Highway 313 southeast from Hardin to Fort Smith. Continue straight through Fort Smith, and continue on the road (stay left at the fork after Ft. Smith) until you see the visitor center located near the top of the dam.